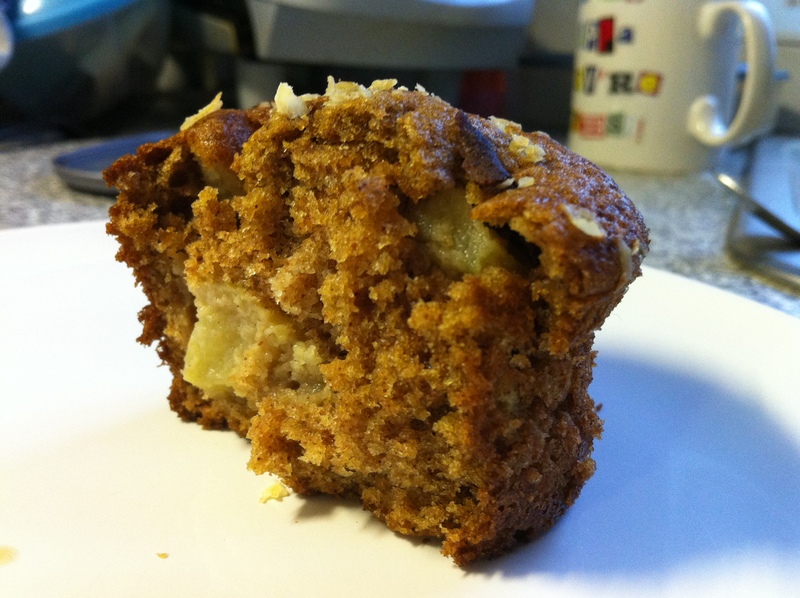 Last week I found that I had a surplus of apples which coincided with an odd muffin craving. Even though I didn’t have any paper cases I wanted muffins so much that I risked baking them straight into my non-stick silicon muffin tin. Unfortunately it wasn’t quite as non-stick as I thought it was; however I managed to rescue most of the muffins. I followed the recipe, which I found from Smitten Kitchen exactly as it was posted, with one exception: I mixed a little demerara sugar and oats and sprinkled this mixture on top of the muffins just before I put them in the oven. I rather like extra texture it gives, and besides, it just looks plain nice! The muffins were lovely and moist and using dark brown sugar gives them an extra level of flavour that regular castor sugar just doesn’t have. 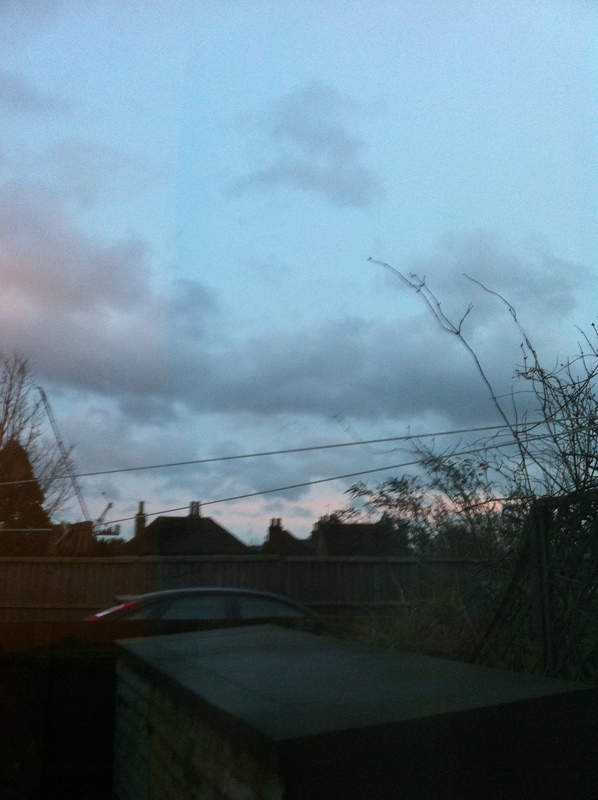 As for the picture of the blue sky, I took a few pictures in the morning just after I ate breakfast the other day and I thought the sunrise was worth sharing. 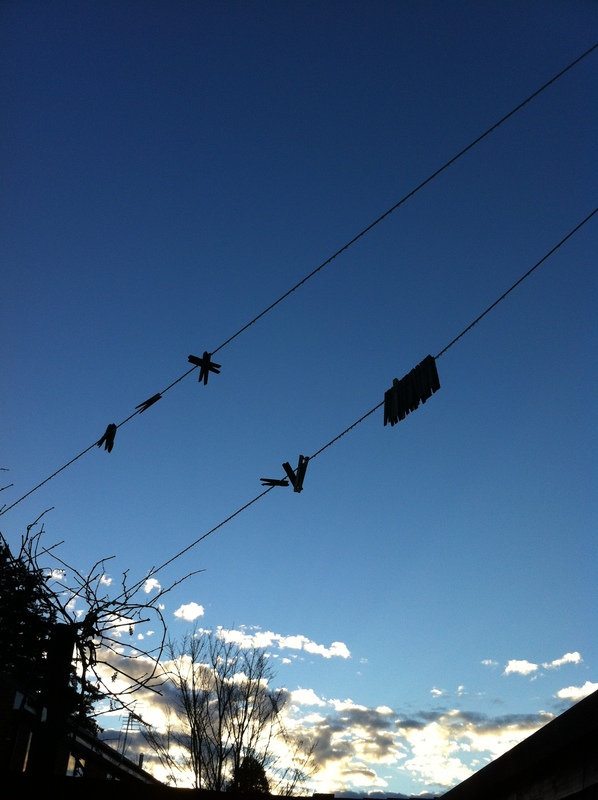 I love the way the clothes pegs hang at different angles – their silhouette and those of the bare trees stand out so well against the tail end of the sunrise. 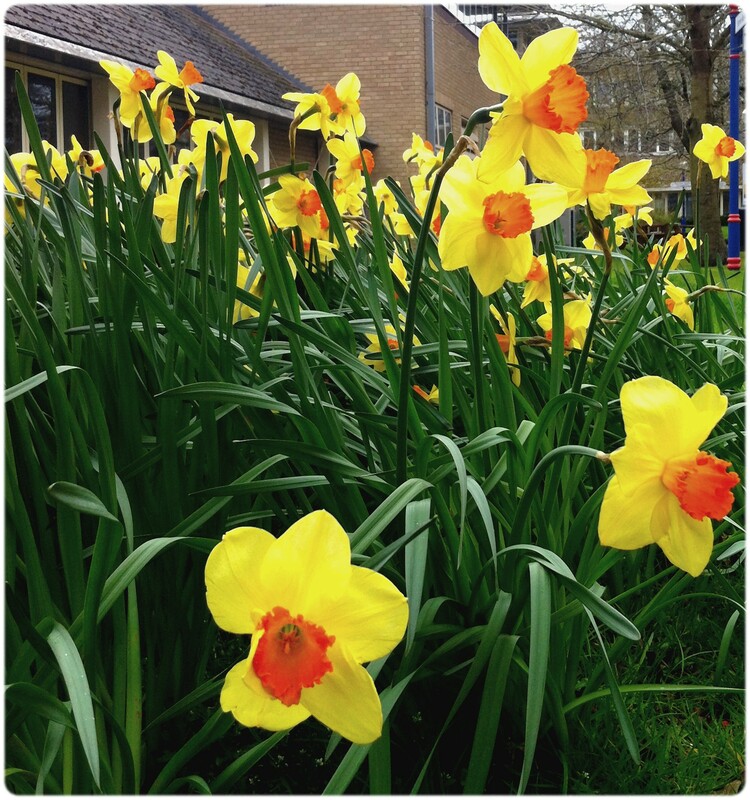 As I write this post it is drizzling outside, but thankfully I live in an area unaffected by the floods; my prayers and best wishes go out to all those who do. Every year, the Christmas season seems to bring either great joy or great sorrow to people. I was a teenager when my grandmother died in hospital on Boxing Day, but on the flipside, she died surrounded by her family, comfortable and warm, after a Christmas Day spent with her family and friends. She had lived a long life and seemed quite ready to move on. I won’t be going any further with this, but instead prefer to wish everyone a Merry Christmas. May you all find some shred of happiness and peace, no matter the circumstances. Onto the baking side of things. This year hasn’t been the busiest for baking, but I am trying out new things. In the past I’ve generally kept to cakes and cupcakes, but this year I thought I’d diversify. In preparation for tomorrow’s Christmas dinner, I made chocolate tarts. I used a combination of recipes – the pastry from Chocolate & Zucchini and the filling from Gordon Ramsay on BBC Good Food. I also used a bit of Green & Black’s espresso dark chocolate to replace the equivalent quantity of plain dark chocolate because I think coffee really enhances the chocolate. However after I did that it occurred to me that using flavoured chocolates is an easy way to adapt this recipe to your personal taste. The coffee taste is subtle but there is still enough to make the tarts a little bit more special. Mix the flour, sugar and cocoa powder together in a bowl. Once mixed, add the butter to the bowl and work the ingredients together. Add a splash of milk and continue to mix. The finished mixture should resemble coarse sand. Divide the mixture and press evenly into tart tins using fingers. Prick the bases of the tarts a few times with a fork to allow air to escape when baking. Alternatively, line with parchment paper and baking weights. Blind bake for 10 minutes in the pre-heated oven. Once baked remove and cool on a wire rack. Break up the chocolate into small pieces and place into a mixing bowl. Bring the milk and cream to a boil. Add slowly to the chocolate, stirring to melt and mix with the chocolate. Once this is all mixed, whisk in the egg and castor sugar. Allow to settle to minimise the number of air bubbles in the final product. Pour slowly into tart shells, filling them almost to the top. Gordon Ramsay recommends serving this dusted with grated white chocolate, cocoa powder or icing sugar and decorated with chocolate curls. I will be serving this tomorrow with a dollop of crème fraîche and raspberries. 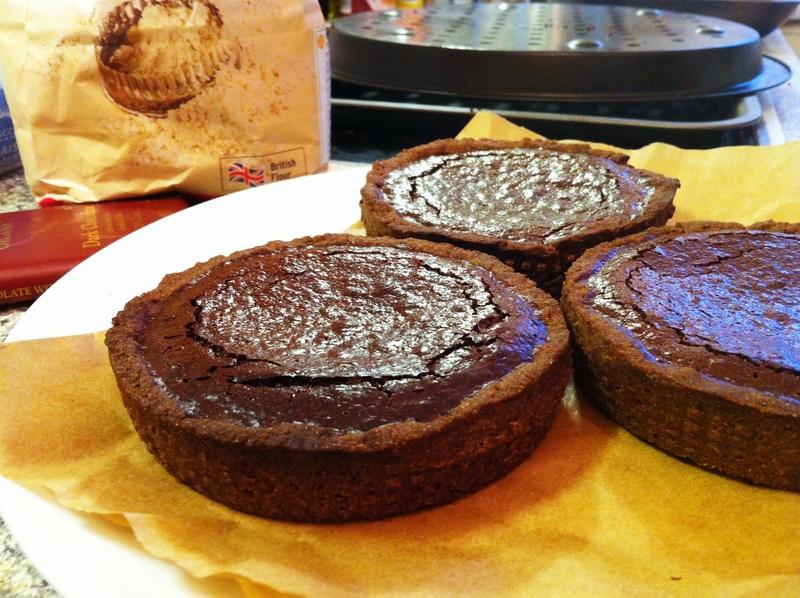 I admit that my chocolate tarts aren’t the prettiest, but I’ve tried one (I made a spare) and they do taste good. The presentation will come with practice. I’m off to a Christmas Eve party in a bit and I do have to get ready so I’ll finish here. So for those who are already celebrating Christmas, Merry Christmas again, and for those who are not yet, I hope you have a great Christmas. So today I had two lots of disappointing news. I won’t bore you with the facts but suffice to say it definitely crushed me today. Well, I got home and then immediately started baking. First I started with shortbread. It’s a simple recipe, with only three ingredients: butter, sugar and flour. 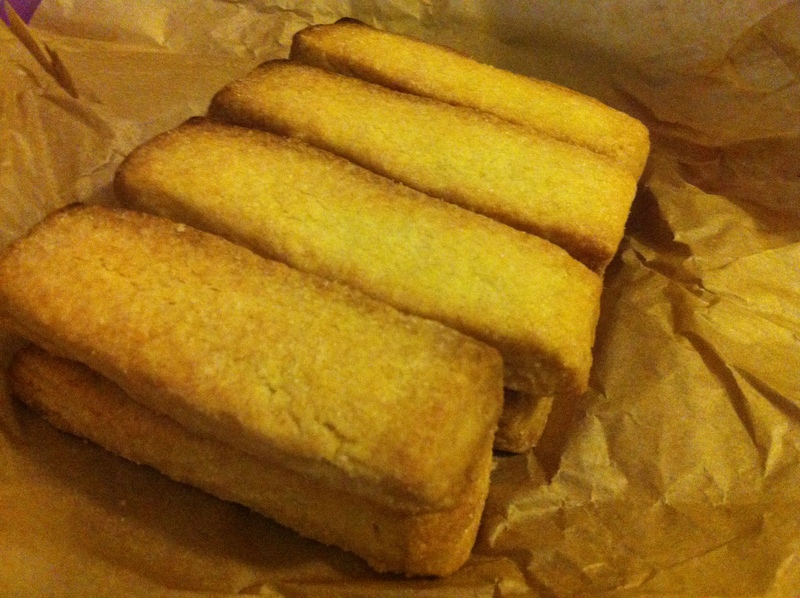 The recipe is one from the ever faithful BBC Food website and every time I make it the shortbread comes out perfect. Also, while the original recipe suggests dusting with icing sugar, I didn’t have any; however castor sugar seemed to work just fine. I’ve been making the shortbread as presents and this picture was taken after I’d wrapped them, so I had to hastily unwrap one for the camera. 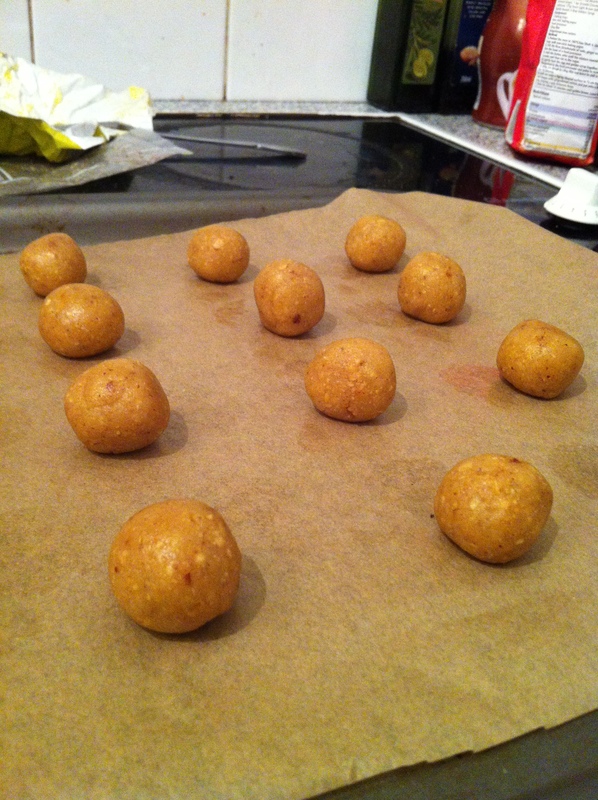 Next I decided to make Baci di Dama cookies. I was reading a blog written by a chef called David Lebovitz. He’s American but he lives in Paris and the pictures of the food he makes never fail to make me salivate. It might just be because I have a huge sweet tooth and he tends towards cakes and desserts. Anyway, I’d spotted the recipe for these cookies and have been meaning to make them for ages, but the main ingredient is hazelnuts, and I keep forgetting to buy some. Well, I finally got round to it and decided that today would be as good as any to finally make these lovely cookies. The dough was fairly simple and kneading it by hand was strangely satisfying. While dividing the dough into marble-sized balls, I couldn’t resist trying it. After all, it was simply hazelnuts, butter, sugar and flour. Delicious. Another note is that I made my cookies with wheat flour, which was the alternative to the rice flour recommended in the original recipe. As I’ve not tried the rice flour version I can’t really compare the two, but the cookies I made tasted and looked fine to me. 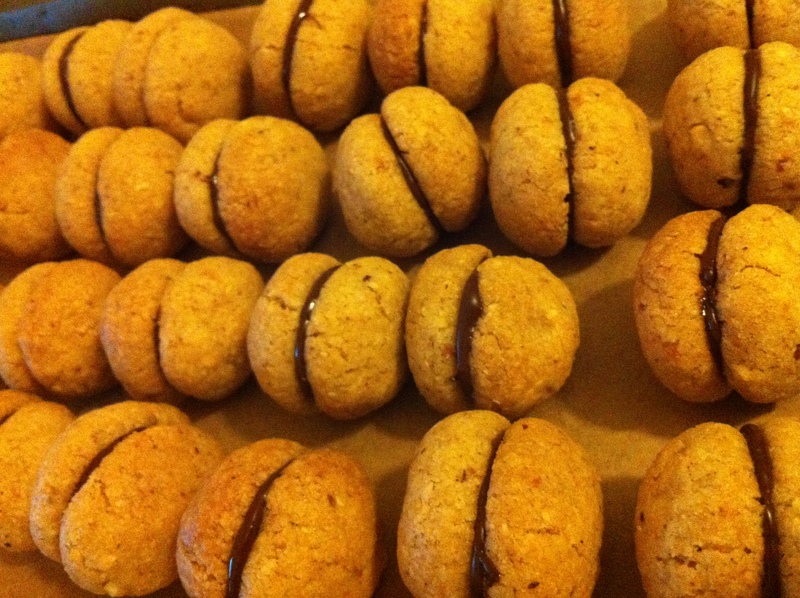 I have to admit that dinner tonight consisted almost entirely of ‘misshapen’ shortbread and Baci di Dama cookies. Well, I did have an apple, a pear and an orange. That’s already three of my five a day!